We are well into the 2016 year and the first quarter statistics for the 457 visa program have been released. Not surprisingly, the number of applications has virtually stayed the same. There is only a slight decrease of 1.9% in applications, which translates into a few hundred less applications which have been submitted. However, the real difference is in the number of applications that were both submitted and approved. There were nearly 5,000 less applications accepted during this one period versus the prior one. That is over a 12.5% difference in the number of accepted applications. There are a variety of things that have or could have contributed to this decline. 2. Australia is accepting less foreign workers because the jobless rate has risen in the first quarter of 2016 compared to the 4th quarter of 2015. This jobless rate increase means that there are fewer jobs for Australians, let alone foreign workers. 3. There could be a delay in processing applications. When graphs like this are created it is of interest to see which states and countries the applications are being approved from and the overall nationalities of the applicants. Every state has seen a decrease in the number of applicants, which is expected, except for New South Wales and Tasmania. In fact, New South Wales has seen a dramatic increase of 8.7% and Tasmania of 3%, which are 10 more applicants than the year prior. 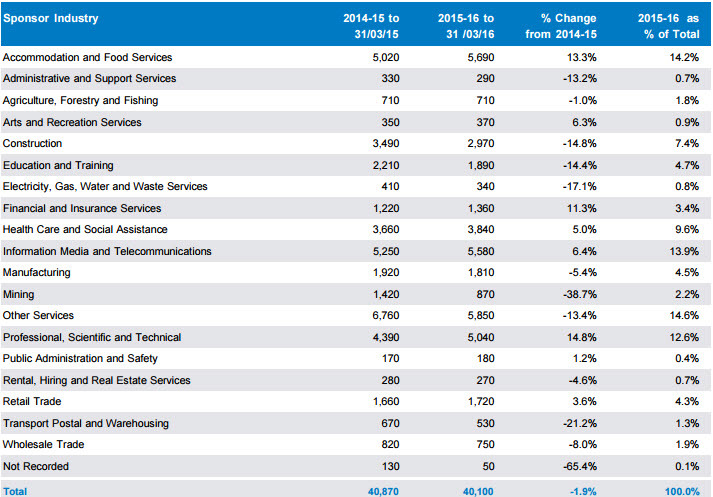 What is also really interesting is South Australia has seen the largest decrease in applicants. Both South Australia and New South Wales rely heavily on tourism, so it’s interesting to see such a large difference in these statistics. The hospitality industry and professional services industry continue to hold the largest number of applicants. They both saw double digit increases in applications this year and each sector claims over 10% of total applicants. These two sectors have continued to be the most popular 457 visa application sectors for many years, which mean that Australia is still struggling finding workers in these industries. Mining and Construction have both seen dramatic drops in applications over the last year. This has a lot to do with the demise in the mining industry boom which mean that many employees who used to work on the mines are looking for other work. These cycles are often seen when comparing 457 visa applications, because only a few years ago there were many more applications for these industries. It goes to show that the 457 visas are really good for industries that are experiencing large growth spurts where Australian skill sets cannot keep up with the demand. Although the hospitality industry saw a significant increase in the number of applications, there are were less applications accepted than the prior year. This may very well be due to the fact that unemployment in Australia is starting to creep up and many Australians are now taking those hospitality jobs for themselves since they are unable to keep positions in other industries that they have been trained in. Most jobs in the hospitality industry are unskilled jobs that can be filled by anyone looking to work in the industry between jobs in their chosen career field. The number of accepted applications continues to be on the rise in the healthcare industry and the financial services industry. This is perhaps due to the fact that there is not enough native Australians being trained in these field and Australia must look outside of its borders to find skilled people in these industries. These industries are directly linked to the overall health of a country and are very important that the highest skilled people work in these industries. As a matter of fact, these are the only two industries that saw an increase in the number of applications being accepted year over year, albeit very small increases. And if you look at the prior graph, they are also part of the few industries that also saw an increase in 457 applications, indicating that people trained in these fields know that Australia is looking to fill positions in these sectors. India continues to be the number one country for 457 visa applications followed closely by the United Kingdom. Because the United Kingdom and India have such close ties with Australia this is not surprising. They often have the same educational system and worker expectations, which make it easier for employers to want to sponsor workers from these countries. However, in years past there were so many more applications coming from these two countries. The United Kingdom in particular used to have many more applicants, but now the number is starting to go down. When the fees for the 457 visa application skyrocketed a few years ago, far fewer applicants came from the United Kingdom and in general all of the European Union. This may be due to the fact that people from the United Kingdom and the EU are able to get jobs in the EU much easier than they can in Australia. They do not need visas in order to get jobs in the EU and the relocation costs are much less expensive. The increase in the fees has really had a large impact on 457 applications in general. Overall, the 457 visa program remains popular but factors ranging from higher unemployment, the lower Australian dollar and higher application fees have made the scheme’s applications remain low compared to the figures around 2010.